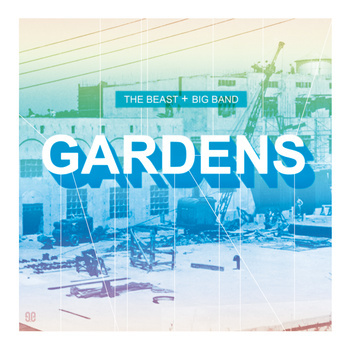 Though I did not blog about it when it happened, one of my favorite artistic achievements of 2013 was the release of The Beast + Big Band’s debut EP, Gardens. We titled the album Gardens for two reasons: 1) we initially assembled this thirteen-member hip hop ensemble for a Duke Gardens summer concert 2) from the success and synergy of that show grew a desire to cultivate the group, arrange more of our songs for big band, perform with the group more often, and even bring it into the recording studio. For a hybrid pianist/keyboardist/composer/arranger, this recording project was a dream come true. I got to bring my talented, musical friends into a recording studio for a weekend, eschew the conveniences of digital editing and overdubbing, and record lush, orchestral hip hop music all together, completely live. With each additional show the Big Band played last year, it felt less and less like a quartet with nine other musicians feverishly executing their written parts, and more and more like a unified group in its own rite. We all had so much fun on stage, and I hope it was palpable and magical for the audience. Now that Gardens has been released for a few months, I wanted to offer everyone the chance to get inside the band. The beauty of the internet is that you have direct, Twitter access to some of the world’s foremost artists, and countless videos on YouTube. I’m inspired by one of my favorite contemporary big band composers, Darcy James Argue, who makes full scores of his works available on his website, completely free. You can pay him for the individual parts if you want your ensemble to perform his works, but he has no qualms about you studying his scores. Open source artistry, y’all. I think it is a great move to help a future generation of jazzers be able to learn from the best. In that spirit, I’d like to offer up the full score to the third track from Gardens, “Cost of Living.” Between Pierce’s lyrical concept, and the song’s balance of tightly calculated harmonies and open, collective improvisation, I think this one track is our manifesto for the whole Big Band project, putting forth what we think a big band can be for hip hop music (more than just catchy horn lines behind a spoken hook). …and here is the score. Follow along! Enjoy the 7-flat key signature and three-bar phrases of the refrain. I also transcribed all of Pierce’s lyrics. Notated rap? Why not?